Israel Football Association says Bnei Sakhnin soccer club violated two regulations for honoring former MK Bishara. The Israel Football Association said Monday it is to take disciplinary measures against an Arab club in the Premier League over a tribute it paid to a fugitive former MK. The IFA said it had "decided to take disciplinary action against Bnei Sakhnin" after the club paid tribute to those who had helped secure a Qatari donation to build its home ground, Doha Stadium. Bnei Sakhnin is the Premier League's only Arab-Israeli club and its state-of-the-art football stadium and sports complex was built with millions of dollars in donations from Qatar - the country hiding top Hamas leaders - in 2005. Among those honored at the ceremony, which took place before a match against HaPoel Tel Aviv on Saturday evening, was Azmi Bishara, a former MK who fled Israel in 2007 after being accused of collaborating with Lebanon's Shiite terrorist group Hezbollah. Bishara, who comes from the northern Arab city of Nazareth and now lives in Qatar, has repeatedly denied the allegations which accused him of advising Hezbollah during its 34-day war with Israel in 2006. Bishara is still wanted for questioning in Israel for transmitting information to Hezbollah. 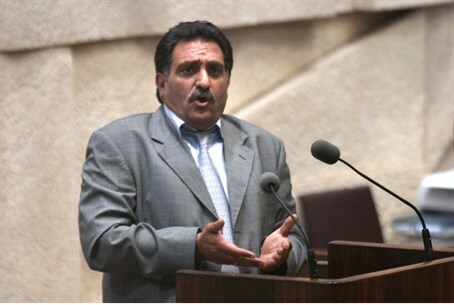 Until the 2011 passing of the "Bishara Law," the former MK was still receiving full pension from Israel, getting a total of 500,000 shekels. The ceremony triggered a furious response from several Israeli cabinet ministers who called for the team to be punished. Premier League chief Oren Hasson also wrote a letter of complaint to the IFA, a copy of which was seen by AFP, saying the club had failed to inform the league about the nature of the ceremony. The IFA said the club had violated two of its regulations, and was guilty of "unbecoming conduct" and of taking a stance, while on the pitch, on disputed political and public issues. The allegations will be examined at a hearing on Wednesday, the association said in a statement. Disciplinary offenses can result in measures ranging from a warning to a monetary fine, losing points or even demotion from the league, IFA regulations state. There was no immediate response from the club. Foreign Minister Avigdor Liberman (Yisrael Beytenu), who in 2006 called for Bishara to face the death penalty over the Hezbollah allegations, lashed out at the club. "When a football team in the Israeli league thanks Azmi Bishara, who is suspected of spying and aiding Hezbollah ... strong measures should be taken against it," he wrote on Facebook. Culture and Sport Minister Limor Livnat (Likud) also slammed the tribute as "crossing a red line", saying the IFA should take "strict measures against the team," Yediot Aharonot reported on Sunday. But Bnei Sakhnin chairman Mohammed Abu Yunes has played down the incident, claiming that rewarding Bishara had nothing to do with terrorism. "A big fuss is being made out of nothing," he told the paper. "We just wanted to thank the people who helped us raise money to support the team. What do they want from us? The establishment doesn't give us money so why shouldn't we raise money overseas?"